Adding text and/or a design to the back of this glass is $10.00 each. Designs on the front of the glass are free. Add an additional $10.00 for a design and/or text on the back of the glass. "The Ravenscroft Crystal Grapes Decanter's unique, ornate grapes imprint and broad base help maximize the breathable surface area which allows your wine's bouquet to fully aerate. The graceful, curved sides that rise create the angled mouth to complete this fully functional, easy-to-pour decanter. The Grapes Decanter is handmade of the finest and most brilliant lead-free crystal, produced from ancient mineral deposits free of impurities." Ravenscroft is the world's leading manufacturer of hand-made, pure, clean, lead-free crystal for fine wine and spirits. This crystal is hand blown: bubbles are normal and not considered to be imperfections. Please consider this when ordering hand blown crystal and glass. 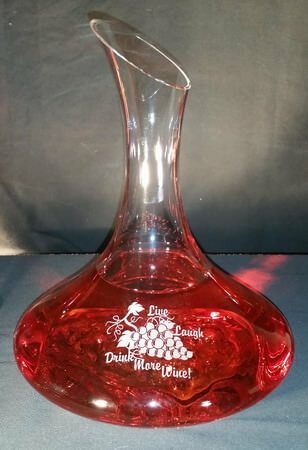 Each individual personalized wine decanter page will have the number of lines and characters allowed below the picture. We do count spaces, but it is okay to go over, we're fairly flexible. 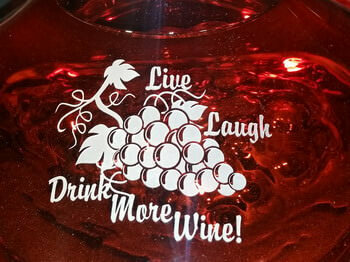 Please keep in mind that the more text you want on a custom wine decanter the smaller it will all be. If you'd like to see a jpg proof of your text and/or design please leave us a note in the comments box and we'll send you one before starting your order. We will be happy to work with you on your personalization ideas. Please note that this is likely to slow production time as we'll wait to hear back from you before starting your engraved wine decanter.